I have the 'Get Windows 10' app running in my tray bar, but when I click on it, it says my CPU is not compatible with Windows 10. How can that be? My PC is currently running Windows 8.1 Pro and only 1 year old -- so I don't understand why my CPU isn't compatible with Windows 10? I read somewhere that if you have Windows 8 or 8.1 that the CPU should automatically be compatible with Windows 10 as the hardware requirements are virtually the same. Any ideas? My CPU is the Intel Core i7 4790K. " You are correct: if your PC can run Windows 8 or 8.1, then the CPU is automatically compatible with Windows 10, even if the "Get Windows 10" app reports that your CPU is not compatible. The reason it says your CPU is not compatible is due to a bug in the "Get Windows 10" app, and there are two patches available for that (one for Windows 8 and another for Windows 7). I'll explain how to fix the bug in Scenario #1 (below). On the other hand, if you are NOT already running Windows 8 or 8.1, you may need to enable a setting in the computer's BIOS to ensure that it passes the Windows 10 CPU compatibility check when you click on the "Get Windows 10" app. I'll refer to this as Scenario #2. Both scenarios are described below. The bug fix described below applies to Windows 8 and Windows 7 systems. On June 1st, 2015, Microsoft released the "Get Windows 10" app which appeared in the tray bar next to the clock (denoted by a white Microsoft logo). Unfortunately the "Get Windows 10" app had problems recognizing some CPUs as being compatible with Windows 10, and therefore produced a false negative with an erroneous message stating: "Here's why Windows 10 can not be installed on this PC: The CPU isn't supported." On June 2nd, 2015, Microsoft released an update to fix the "Get Windows 10" app, but the update may not have been automatically downloaded as it was originally marked Optional, then later changed to Recommended. If you have Windows Update set to manually download updates, then you would have to manually select this update to have it installed. Please note that the patch is only available through Windows Update. For Windows 8 and Windows 8.1 systems, the patch is KB2976978; for Windows 7 SP1 systems, the patch is KB2952664. The links to each of the KB articles only describe the patch but do not have a download. Click Start and type in "View installed updates" (no quotes) and then click on the icon that says "View installed updates". When the Installed Updates window appears, go to the Search box at the top right, and type in "KB2976978" (no quotes) if you have Windows 8, or "KB2952664" (no quotes) if you have Windows 7. If you see "Update for Microsoft Windows KB2976978" (Windows 8) or "Update for Microsoft Windows KB2952664" (Windows 7) appear in the results, then then you already have the update installed. You can try and apply the patch manually again using steps described further down in the next heading "Apply the Patch to the Get Windows 10 App". Click Start and type in "Windows Update" (no quotes). The Windows Update window will appear; in the top left, click the link that says "Check for Updates"
If there are no new updates, then you will be taken back to the Windows Update main window again. If that's the case, click on the link that says "Show all available updates" which is located somewhat in the middle of the window. Scroll through the list of available updates and look for KB2976978 if you have Windows 8, and KB2952664 if you have Windows 7. Pay attention to the "Optional Updates" link (if you have updates already ready for download), otherwise look for the "Optional Updates" heading in the list of all available updates. Once the patch has downloaded, you may need to reboot. Even if the patch (above) has been downloaded, it will still need to be applied to the "Get Windows 10" app. Normally this happens within a day or two with the Windows Task Scheduler, but you can manually apply it using an Administrative command prompt. Click Start and type in "cmd" (no quotes, and do NOT press Enter). Wait for the Command Prompt or CMD.EXE to appear in the list, then right click it and select "Run as Administrator". schtasks.exe /Run /TN "\Microsoft\Windows\Application Experience\Microsoft Compatibility Appraiser"
Right click over top of the highlighted text and select "Copy" from the dialogue menu. Go to the Administrative command prompt you opened up in Step #1. Right click in the middle of the command prompt window, and select "Paste" from the dialogue menu. The text you copied in the previous step should now have paste into the command prompt. If it did not, repeat the step previous and try again. If it did, then press Enter on your keyboard to have the command execute on the command prompt. Now, go to the "Get Windows 10" app (next to the clock in the tray bar) and right click over top of the white Microsoft Logo. Select "Check your upgrade status" and it should give you a message stating that you can reserve your copy of Windows 10. If the app still reports your CPU isn't compatible, will need to double check your hardware settings described next in Scenario #2. If you receive the message that your CPU is not supported in Windows 10, it may be because two reasons. First, you need to ensure that your CPU supports PAE, NX and SSE2 instruction sets. Secondly, you may need to enable a setting in your computer's BIOS (described further down). If your CPU is compatible, proceed to the next step to ensure that your NX bit is set in the BIOS. Even if your CPU supports NX (no execute bit), you may still need to enable the NX feature in BIOS in order to pass the Windows 10 CPU Compatibility check (via the "Get Windows 10 app"). To access the computer's BIOS, you will need to reboot and then press a specific key (usually DEL, F2, or F12). Once you are in BIOS you will need to look for the NX setting - it is usually shown in the 'Advanced Configuration' menu (or similar), though every BIOS is different, so the heading may also be different. Also note that the NX (no execute bit) can have multiple names in a BIOS, including EDB (Execute Disabled Bit), Execute Disabled Memory Protection, EVP (Enhanced Virus Protection), and No Execute Memory Protect. Keep your eyes peeled for all of those names and then enable the setting. Then, choose to exit the BIOS and (important!) save your changes. Boot the computer as normal and then try the "Get Windows 10" app again. To do so: click on the "Get Windows 10" app near the tray bar, then right click and choose "Check your upgrade status" link to see if your CPU passes. If it does not, refer to Section #1 in case you need to patch the "Get Windows 10" app so it properly recognizes your CPU. The final tip in this long saga is to force the NX bit inside of Windows, but only if your CPU supports it. I've had people email me and say they've tried all the steps on this page (above), but the "CPU Not Supported" error still persisted. This is the final thing that made it work. At this point please bookmark the page in your browser, as you will need to restart (reboot) the machine after executing the above command. When the reboot is complete, come back to this page and proceed to the next step. 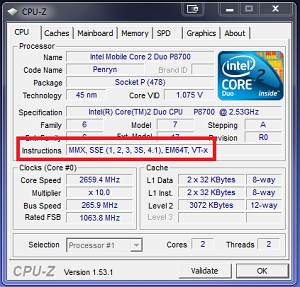 Use CPUz to note the make and model of your computer / laptop's motherboard, as well as the BIOS firmware version (pic). Go to the manufacturer's website and browse through the BIOS / firmware updates to see if there is (a) an update to your BIOS firmware and (b) those updates make any mention of a Windows 10 compatibility / update / fix. If so, download the update and flash the BIOS. Instructions for flashing the BIOS will be on the manufacturer's website. IMPORTANT: I highly recommend you do not flash your BIOS unless there is a specific "compatibility" update for Windows 10, or a CPU microcode update. The reasoning here is that if the flash fails, it will brick your motherboard - unless you have a BIOS backup chip, which is only available on certain models. The only way to fix a bad flash is to ship the entire computer / laptop to the manufacturer and have them re-flash your BIOS chip. This costs time and money. The final step here is to download Windows 10 using the Media Creation Tool - I've provided full details on how to do that. If the Media Creation Tool doesn't work you can also try the Windows 10 Tech Bench version which downloads the ISO directly from Microsoft without the Media Creation Tool. Ideally you should install Windows 10 from the desktop as this is the way Microsoft wants you to do it. However, if it fails to install from the desktop you can also try rebooting the system and install that way, as this is now allowed since the Windows 10 November, 2015 Update. You will need your Windows 7 or 8 CD Key to do the installation; you can use Magic Jellybean (free) to extract the key. Ignore any antivirus warnings stating the program is not safe (it is safe). If you found my instructions helpful please link to this page or share through Facebook, twitter, etc. Much appreciated! Update 20171112: Microsoft has recently released news that the free upgrade to Windows 10 will end on December 31st, 2017. If you install Windows 10 beyond that (after downloading it using the Media Creator tool, for example), you will be asked to activate Windows 10. The only way to do that is to purchase a Windows 10 license. RE: "HELP ME PLEASE! Is my CPU Compatible?" I appreciate the kudos from people telling me how this article was helpful to them, but at the same time I am also overwhelmed with emails from folks asking me if their CPU is compatible. I kindly ask that you please don't email me your CPU specs asking me this question. Download the windows 8.1 upgrade assistant. If your CPU is compatible for Windows 8.1, you can run Windows 10 64-bit. Update 20160729: Microsoft pulled the link on the Windows 8.1 upgrade assistant and replaced it with a Windows 10 FAQ (bastards!). You can still get the Windows 8.1 upgrade assistant from softonic.com; I refused to link to their site - reasoning: they will ask you for your email address just to download the file, then spam you with their newsletter. If you grab it from them, I suggest you use a junk email address. If you find a better link, email me. If your CPU does not pass the Windows 8.1 upgrade assistant, then you can instead run Windows 10 32-bit - I'm 99% sure of that and have upgraded lots of systems that did not pass the Windows 8.1 upgrade assistant / Windows 10 CPU compatibility check. That said, if you run Windows 10 32-bit, you can only use up to 4GB of system memory - so keep that in mind. RE: "Please! There must be another way! I swear my CPU is compatible!" I have had users email me in the past telling me this worked when all else has failed. This is a very drastic measure, however, if you go this route and you intend to restore your user data from the backup, you will need to reset file permissions on the data properly - otherwise you won't be able to access your files. You will either get "Access denied" while trying to open or write to the files, or the folders will simply appear empty. This is rather technical and beyond the scope of this article - and doing it the wrong way could hose your operating system. You've been warned! In either case, you are welcome to contact me for assistance - I can help with the file permissions OR I can do all of the above steps for you using my remote desktop support service (paid support). To do so: please clearly state your intention (I.E. : that you need to reinstall Windows due to the CPU not compatible error), and I will do my best to get back to you. Please do not email me asking me why your CPU isn't compatible and "what should I do next? ", otherwise I will simply delete the email - much thanks. If you still don't know what to do, start from the beginning of this article and make your way down - read it carefully. This article is very definitive in how to resolve the error. Dennis, my wife and I each have the same model of Dell laptop bought at the same time. Her's has the 'Get Windows 10' app running in her tray bar, mine does not. I followed your instructions about updates and checks and I still don't get it in my tray bar. Further down on the page is this statement "This update is not required to get Windows 10, you can still get it even though you don't get the notification. Just download it on July 29th 2015 when it becomes available. You will have one year to do so. The Reserve app is just a reminder/notification for its availability." Just keep your machine updated and when Win 10 becomes available download it and install it. In the meantime your app may appear in your taskbar while you are waiting. I've downloaded the program CPU-Z and found out in the instructions heading that i only have MMX,SSE,SSE2,SSE3,SSSE3,EM64T but i dont have either the VT-d/VT-x (which is required for NX support as you stated). Is there a fix on this?. Because after i apply the patch and enable the EDB in the BIOS, still the W10 upgrade says CPU not supported. incuboy_mae_5071 said that NX requires VT-d/Vt-x, but I'm reasonably sure that's incorrect. After some intense effort in August to get the Upgrade of Windows 10 on a pair of identical Acer Aspire One's with Intel Atom N455 1.6GHz and a complete surrender I decided to try again this week. I was successful with both. Following directions from a recent article I can't find anymore I installed CPUID (CPU-Z) to check compatibility. The article explained that the designation of NX came under another heading in the information supplied in that little gem. I was indeed lacking in VT-d/VT-x but I tried on the first Acer anyway and the install was successful. I found it helpful to delete and let the graphics driver reinstall after, as I noticed some glitching. I also had some remnants of uninstalled Microsoft Security Essentials that were causing a maxed cpu issue but I worked through that and ever since I've been happy. On the second Acer I had trouble with the 10 installer saying my processor wasn't NX compatible and found this super article. Thanks. I didn't used the steps outlined because the comment by darran_5548 below, used opposite to his success worked (see my comment under his). I have confirmed that my Intel I5 - 3ghz CPU is enabled with NX but I still get the error message saying my CPU is not compatible. Can I still install Win 10 from the download I did with the Media Creation tool? "Even if your CPU supports NX (no execute bit), you may still need to enable the feature in BIOS in order to pass the Windows 10 CPU Compatibility check"
I just spent hours on this problem with a Dell Latitude E6420 with a Core i5-2520M CPU which I know meets the requirements above. I even used CPU-Z to make sure. I tried everything suggested above, updated the BIOS to different versions, reset the BIOS to defaults and configured it multiple times. The setting in question is called "Enable CPU XD Support" under Security in the Dell BIOS and defaults to checked/on. However this does not pass the check in the Windows 10 app in the taskbar, and you cannot perform an in-place upgrade using the media creation tool either via USB boot or from within Windows if this occurs. Try it if you don't believe me. For anyone finding this post with a Dell machine - here's the fix that worked for me: Try un-checking the box for "Enable CPU XD Support" under Security in the Dell BIOS. Amazing it worked for me - once Windows 10 was installed and working I turned it back on again. Works perfectly. Unbelievable. Thanks for the information on your page. It has been extremely helpful. However, after following all the instructions, including the link to the one about using the Media Creation Tool, I was still unable to install WIN10. I even resorted to contacting the Microsoft Support chat service (but they were not helpful at all). Anyway, thanks to your guides and areas to try, I did come across something that is not in your solution that did work for me. Mine was set to "Turn on DEP for all programs and services except those I select" - of which there were some non windows programs listed. I changed the setting to "Turn on DEP for essential Windows programs and services only". Click APPLY, and then OK'd all the way back out. I re-ran the SETUP.EXE for your suggested Media Creation Tool, and bingo - no more unsupported CPU processor messages. I suspect, that doing this before creating a media creation tool and only using the Windows 10 download tool on one's taskbar might also work (but I'm not trying that as now have fully functional Windows 10 Pro PC). The only other suggestion I have, in the install process for Win10 - when it asks if you want to include critical updates in the install process - DO NOT SELECT. Choose the other option. I did select first and it hung on 32% installation (something about drivers). After re-doing without the updates included - it works. Again, thank you for all your help, it definitively got me on the right track (just needed one additional check to include). I had to "Turn on DEP for all programs and services except..."
My computer was set on the "Turn on DEP for essential Windows programs and services only" and I was getting the false processor incompatible message. I build on darran, your suggestion, and set it to "Turn on DEP for all programs and services except those I select" and just left the box underneath blank, and that worked to allow me to upgrade to 10 on a Acer Aspire One N455 1.6GHZ. Thanks. no nx support in processor. I also run the setup in the source dir of the dvd. You made my day, week and month!! Excellent article. Lot of thanks! Thanks for great article. I tried everything on this page, nothing worked. There was no processor tab in my bios, so nothing I could do there. Then I decided to update bios, and after that it worked. Maybe you could add that to the list of possible solutions. Yes - this is another possibility, though for the majority of people it would be under rare circumstances. I will certainly add mention of this in the article.